The contemporary American suburban community is wasteful, with cars for every individual and guest rooms, exercise rooms, weed eaters, snow-blowers and other equipment severely underused. With the planet under severe environmental stress and the average American using some four times their fair share of resources, wouldn’t it be great if there were a way to share equipment and facilities? Yet I, for one, wouldn’t want to move into commune, share everything, and lose my individuality. Cohousing is thus an alternative to traditional suburbs, which encourage social isolation. “Suburban developments are designed to maximize privacy, while cohousing seeks to balance private places with public spaces,” says Ann Zabaldo, past-president of the Cohousing Association of the United States. She describes cohousing as mainstream, which is true in aspiration if not in reality. With cohousing’s social cohesion come environmental benefits. “What’s so cool about cohousing is it’s just naturally green because part of the model is that you cluster the houses, so the carbon footprint is much smaller,” says Zabaldo. A condo in a cohousing development may be half the size of a traditional one, yet, with all the shared amenities, quality of life is just as high. 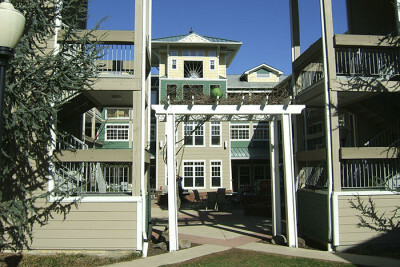 Zabaldo cites studies from the 1990s that indicate cohousing uses 49 percent less water and “50 percent less energy than a standard condominium community of the same size.” Jack Wilbern, resident founding member and architect of Blueberry Hill cohousing, mentions another study that cohousing generates 10 percent fewer car trips. Opened in 2000, Takoma Village consists of 65 adults and 20 children, with the biggest condo at 1500 square feet. 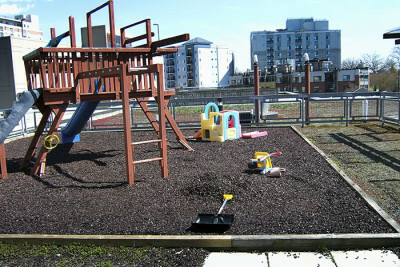 Like many cohousing developments, Takoma Village is designed around an open, grassy courtyard, on which children play, and is south facing to make use of natural sunlight. Parking is limited to one space per unit, and is tucked away to the side of the building, making the central space safe for playing children, and car-fume free. The entire community makes use of only three lawnmowers, and other equipment is shared, such as sleds for a snowy winter’s day. Cohousing residents tend to be environmentally aware. Zabaldo believes that Takoma Village would have received a high LEED rating—the gold standard for environmentally friendly buildings—had such ratings been available when the community started. Takoma Village was built with ground source heat pumps, some five times as efficient as conventional systems. Extra insulation further saves on energy costs. 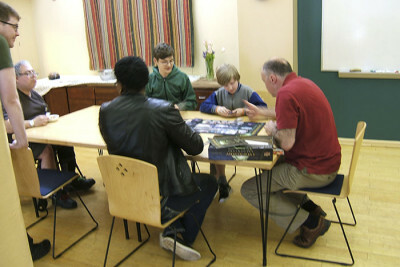 Such decisions are facilitated by the design possibilities and community awareness of cohousing. “Unlike a traditional condo, everyone has a stake,” exclaims Zabaldo. The community also practices recycling and composting, uses low impact pesticides, and provides its residents with raised-bed gardens. People often share cars, for instance going on errands together. Takoma Village’s location, near a DC metro station, with Zipcars and bikeshare available, also cuts down on driving. Zabaldo explains that four households in Takoma Village don’t even have cars. Having an environmentally aware community means that a development built green can become greener with time, says Zabaldo. For instance, Takoma Village was an early adapter of CFL bulbs and is switching to the next generation, LED. In addition, they are investing in solar panels, now that the price has plummeted. About two miles up the road from Takoma Village, in Silver Spring, Maryland, lies Eastern Village, a cohousing community that does have a Silver LEED rating. 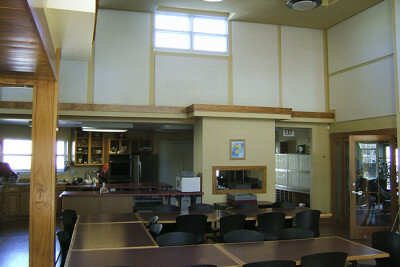 Consisting of 56 households, Eastern Village, which opened in 2004, was reconstituted from an old commercial office and parking garage—an environmentally efficient reuse of an old building. Like Takoma Village, Eastern Village features a lush central courtyard surrounded by patios looking down. Despite the similar basic design, however, the feel is different between the traditional, almost rustic Takoma Village and the grand, modernist Eastern Village. This is captured by a stylized silver statue of leafs stretching outward that dominates the courtyard. Eastern Village’s most notable environmental features are a green roof above and geothermal heat pumps that extend 300 feet below. “Our space heating cooling and hot water are estimated at 40 percent less than conventional building,” says Naomi Friedman, one of Eastern Village’s original residents. The green roof, a living vegetation system, moderates temperature, reduces the carbon footprint, and retains rainwater preventing harmful runoff. 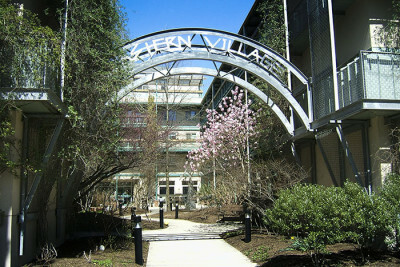 Eastern Village has received numerous awards, including Green Project of the Year for 2005, a green roof excellence award, and a 2010 Multi-Family Recyling Award. The 6,000 square foot common house includes bamboo floors and recycled carpet. The community is located in the Silver Spring Arts and Entertainment District, ten minutes away from Metro, Amtrak, commuter rail, and numerous buses. Nearby restaurants and a grocery store, as well as a lively downtown, reduce the need for driving. Indeed, “Several households do not own a car; many only have one,” says Friedman. A slightly less urban cohousing community, and hence more dependent on automobiles, is Blueberry Hill, located in northern Virginia about 15 minutes (by car, on a traffic-free day) from DC. The community does possess one attribute lacking in Takoma and Eastern Village: it is located at an organic farm, Potomac Vegetable Farms. Blueberry Hill was first constructed in 2000, on the least cultivated portion of the farm, and in a way that avoided impact on a nearby stream. The development “consolidated a small footprint” on four acres, rather than the 20 homes on 20 acres of a traditional development, explains Wilbern. He credits this compact size with saving the farm from development. Wilbern is proud of Blueberry Hill’s association with Potomac Vegetable Farms. “For us, that’s a fairly big sustainability issue, keeping food in production,” he states. While the two are separate entities, many Blueberry Hill residents participate in the farm via Community Supported Agriculture; some of the teenagers even work there. When the area was hit by huge snowstorm, Blueberry Hill residents volunteered to help the farm, a neighborly ethic cultivated by cohousing. Blueberry Hill does have a larger housing footprint than Takoma Village and Eastern Village due to zoning rules that require detached housing. Nevertheless, the community committed early and often to the environment, for instance using geothermal heating and cooling. 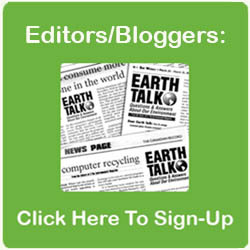 Wilbern points out numerous ways in which residents inspire each other to be greener. “There’s always an advocate,” he says, for instance “somebody who’s the compost king or queen.” (I feel a twinge of guilt here, as composting is one area I haven’t delved into.) One couple has a bin for recycling batteries, while others deal with bags, CFLs, and Styrofoam. Still another resident is an expert on refrigeration, available for the best advice when buying a new unit. Cohousing provides “ready access to people with great information who feel strongly” about a given issue, says Wilbern. Everybody wants to do right by the environment; having a pool of people working together makes it that much easier. Allowing people to pool efforts and relationships, yet still providing privacy, would seem to make cohousing an obvious model for residential development. However, it has not yet taken off in the United States. The word “cohousing” itself remains obscure. Zabaldo reports that there are 143 such communities in the United States, with an additional 50 to 100 exploring some sort of development. Still, in a nation this big, such numbers are tiny. Zabaldo does see some wider impact from the movement, arguing that developers are beginning to imitate the extensive common areas and community amenities of cohousing. There’s an obvious social gap that needs filling—and environmental benefits that happen along the way. Yet this is far from adapting cohousing in the mainstream. Time will tell—perhaps spurred by the efforts of committed people—whether cohousing can play a larger role in building an environmentally sustainable society. Informative article that I hope will be read by many in the UK, where cohousing is also increasing. One thing to add would be the reasons why senior cohousing is especially attractive. Planned active ageing in cohousing eliminates the problem of loneliness in later years. Also, seniors often downsize making their cohousing homes more manageable while still enjoying the shared space of the common facilities.